A design pattern is a general, reusable solution to a commonly occurring problem. In this article we are going to look at some common design patterns we can use for Node.js. design pattern in which one or more dependencies (or services) are injected, or passed by reference, into a dependent object. Let’s look at an example where we pass a database as a dependancy. This pattern provides us with a generic interface for creating object, so we don’t have to worry about the nitty-gritty of the complex constructors. Factories make testing much easier as you can inject module dependencies using this pattern. 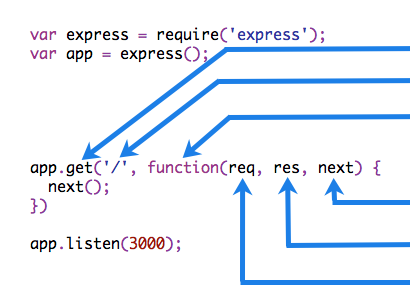 Middlewares (or pipelines) are an essential part of Express, where the output of one unit is the input of the next. The observers notify the owner object on state changes automatically. In Node.js we can use EventEmitterto implement this pattern. Now we can use this observable by adding some functionality to it. Now our observable can emit event. By using singleton pattern we are making sure that the number of instances of a class is restricted to one. Now let’s use this module to instantiate an object. Because require is common in Node.js, that makes the most common pattern. Stream are like special pipelines, designed for complex operations like processing large amounts of flowing data. It is totally up to you when to use patterns in Node.js, but having this knowledge in your toolbox will come handy.